As the February dusk falls on Tainan City, the streets of Yanshuei District fill with people. 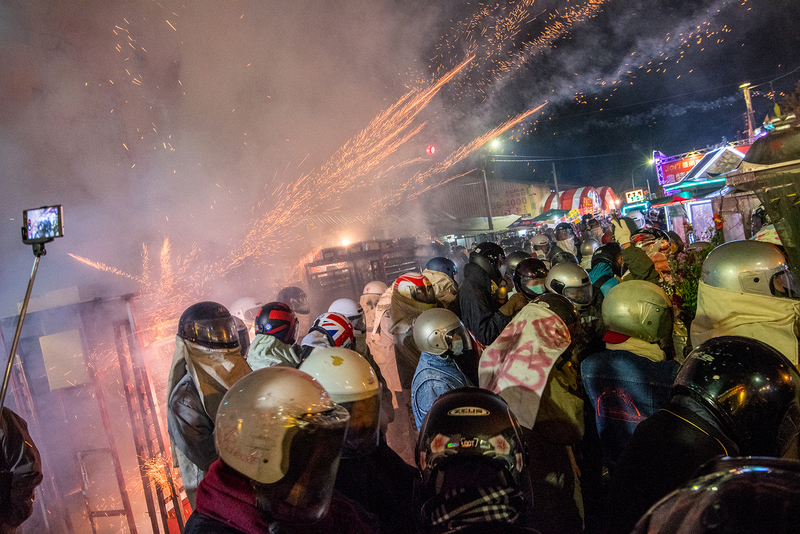 Dressed as if for a day of winter sports in heavy jackets, gloves, and scarves, their faces masked by motorcycle helmets with the visors pulled down, they cluster around elaborate palanquins containing statues of a seated warrior and draped with strings of firecrackers. A blast of flame from a blowtorch, and one of the litters explodes, sending rockets screaming into the air and the crowds. But instead of rushing away from the erupting palanquin, the spectators raise their armoured heads and hands to the shower of sparks. 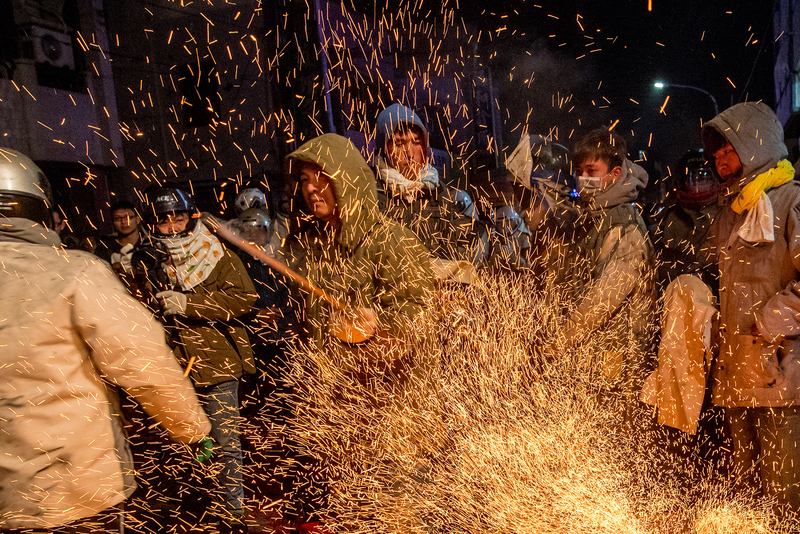 For this is no ordinary fireworks display; this is the Yanshuei ‘Beehive’ Fireworks festival, where to bathe in falling embers is thought to ensure good luck and good health in the new year — and to actually be hit by a rocket is luckiest of all. Legend has it that in the late 19th century, Yanshuei was gripped by a cholera epidemic. With the death toll mounting daily (and without the benefit of our modern understanding of the importance of sanitation in controlling the disease), the terrified locals invoked the deity Guan Di, an ancient general believed to have the power to exorcise demons. At the lunar new year, they paraded through the city with palanquins bearing the likeness of Guan Di, and ignited firecrackers on the roadside to light his way. The epidemic eased soon afterward, and since then, the citizens of Yanshuei have welcomed each new year with an ear-splitting display of firepower pleasing to the warlike Guan Di. 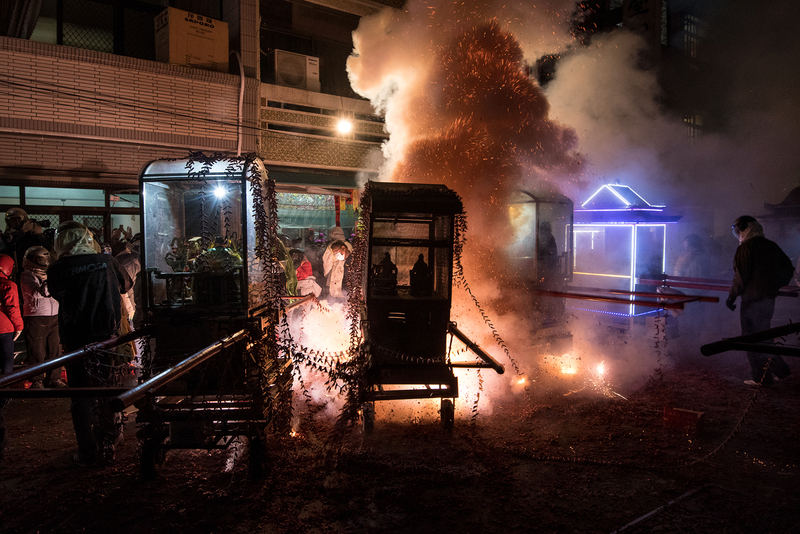 Today, this literal baptism of fire is one of the largest folk celebrations in the world, attracting spectators from across Taiwan and beyond who come to rush the ‘beehive’ palanquins, so-called because of the buzzing sound of the thousands of rockets going off at once. It coincides with the Taiwan Lantern Festival, a countrywide new year celebration held annually on the 15th day of the first lunar month, which usually falls in late February. The focal point of that festival is the release of paper lanterns, which carry the wishes of the people to the deities, minus the pyrotechnics. 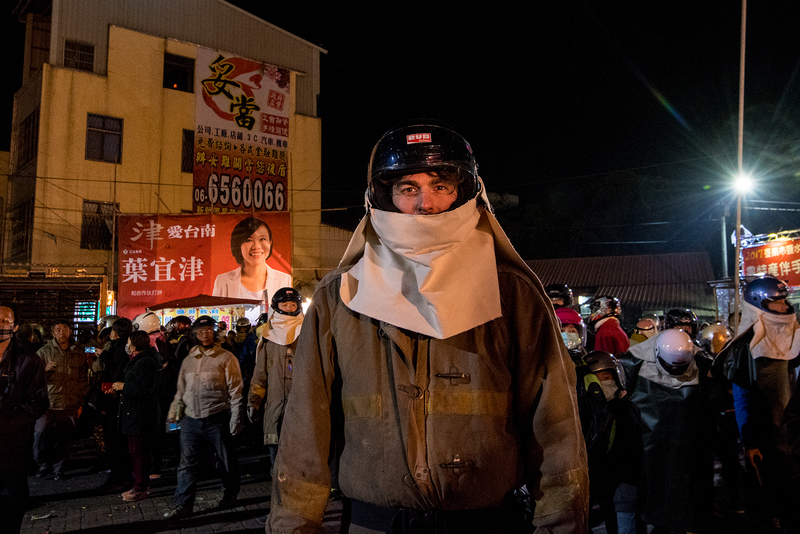 Canadian Geographic Photographer-in-Residence Neil Ever Osborne travelled to various cities across Taiwan during this year's lantern festival to see how their locals ring in the new year — occasionally putting himself right in the line of fire. Find more photos in the forthcoming fall issue of Canadian Geographic Travel. 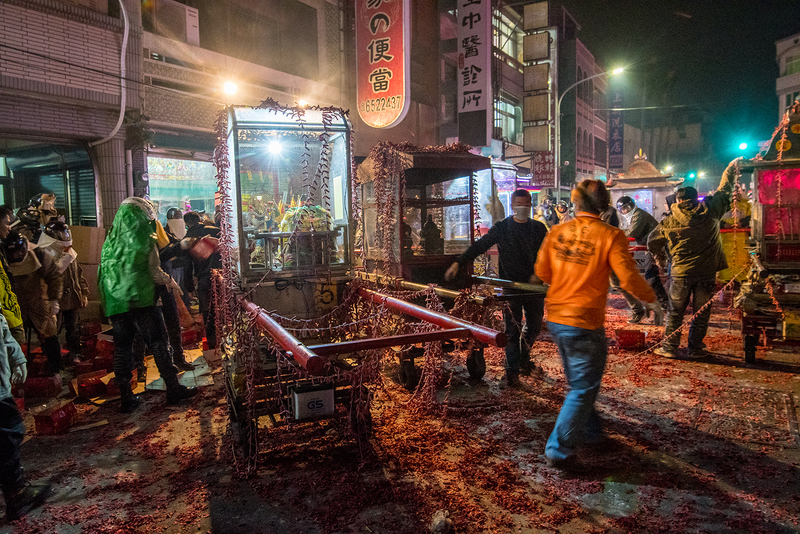 Celebrants at the Yanshuei "Beehive" Fireworks in Tainan City prepare their palanquins — containing statues of the deity Guan Di — by draping them with strings of firecrackers. The firecrackers begin to ignite; soon the air will be filled with flying sparks as the palanquins explode with a sound like thousands of bees leaving a hive. Fireworks spray out into the crowds of revellers; to be touched by the embers is thought to bring good luck and good health in the year ahead. The photographer in protective gear, ready for the rain of fire. 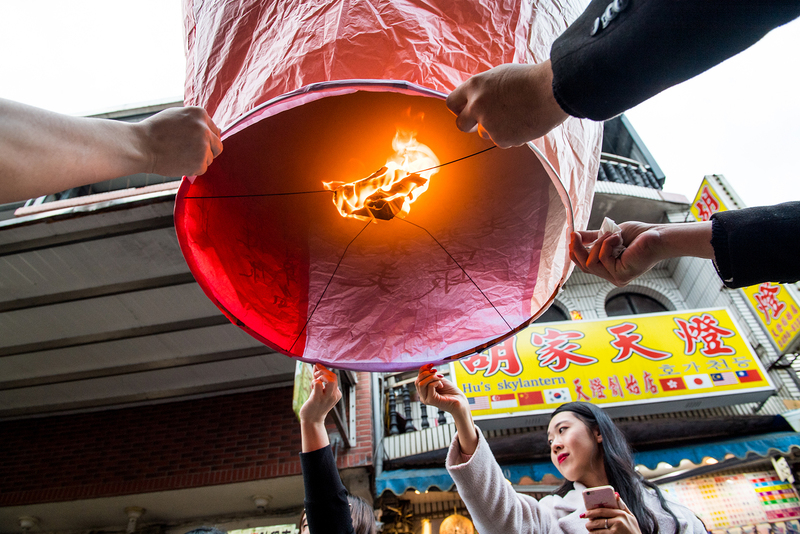 While residents of Tainan City invoke good luck for the new year with a noisy display of firepower, in Pingxi District, New Taipei City, a more sedate custom holds — that of releasing paper sky lanterns, inscribed with prayers to the deities. Lantern shops line Shifen Old Street, and lanterns can be purchased and released at any time of year, but nothing compares to the spectacle of thousands of lanterns being released at the new year. 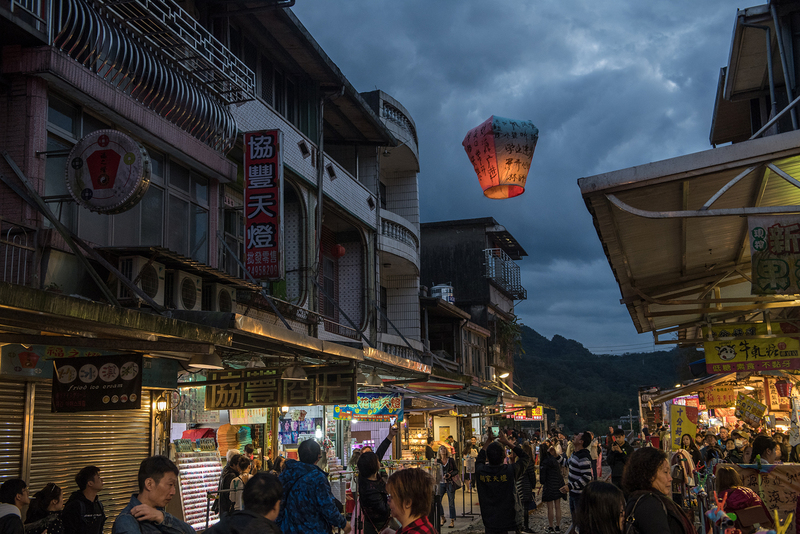 Sky lanterns float above Shifen Old Street during the Pingxi Lantern Festival in New Taipei City. 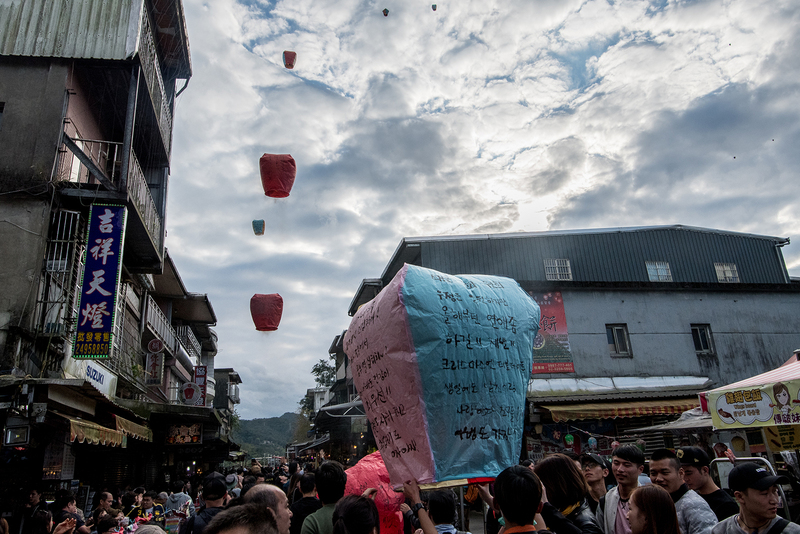 A sky lantern floats above Shifen Old Street as dusk falls in Pingxi District. The flagship event of the lunar new year in Taiwan is undoubtedly the Taiwan Lantern Festival, which takes place in Huwei Township, Yunlin County. The festival features towering lantern sculptures displayed around a 40-hectare fairground, reflecting various themes including “Friendliness to the Earth,” “cultural diversity” and “Indigenous Yunlin." 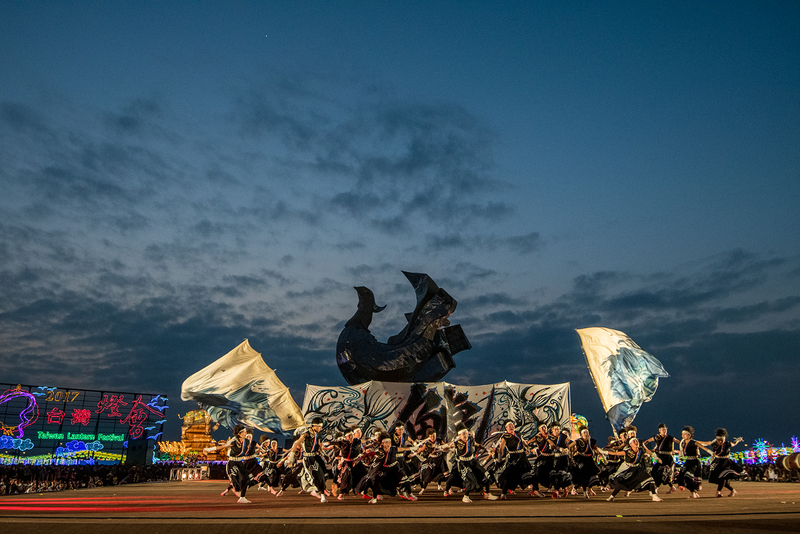 Here, dancers perform at the opening ceremony of the 2017 festival. 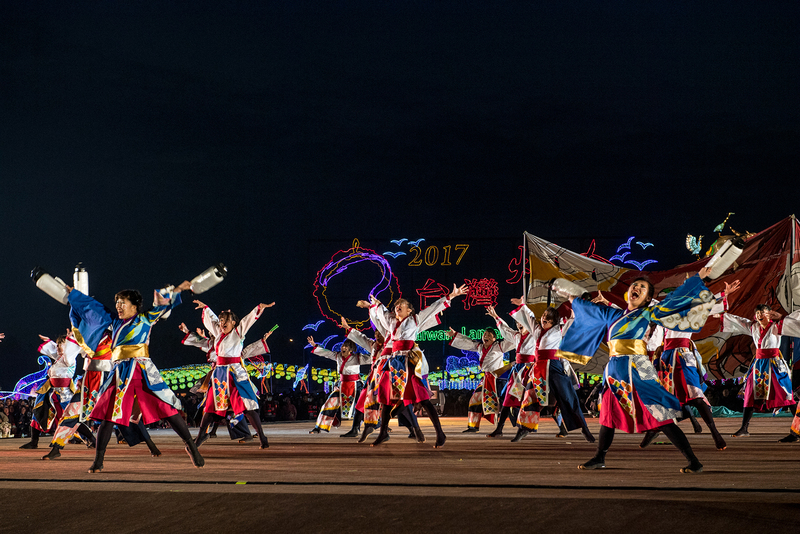 Dancers perform at the opening ceremony of the 2017 Taiwan Lantern Festival. 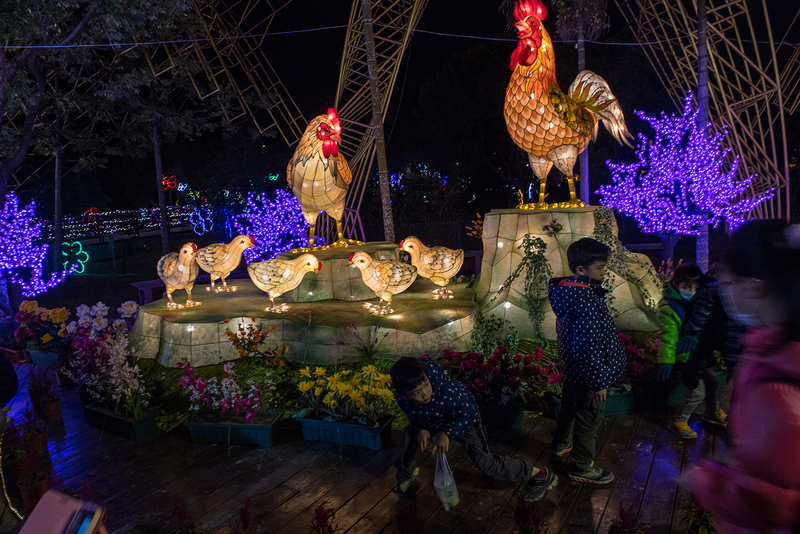 Children play in front of a lantern honouring 2017 as the Year of the Rooster according to the Chinese Zodiac.